In current form of Puja Vidhi, devotees visit Shiva temples early in the morning. Most people finish Shiva Linga Puja before noon as most temples are closed after that in preparation of evening Darshan. Most Shiva temples open in the evening only for the Darshan and not for the Puja activities. In the morning devotees perform Abhishek with milk and water and offer different items to the Shiva Linga including Bilva leaves, Bilva fruit and Dhatura. It explains how Maha Shivaratri is celebrated and known by most of the Indians. However, there is another strict Vidhi which has been suggested in most religious books. Following Puja Vidhi during Maha Shivaratri has been collected from various religious texts. We have included all main rituals which are suggested during Maha Shivaratri. It is suggested to have only single meal a day before Maha Shivaratri fasting. It is one of the common practices during fasting to make sure any undigested food is not left in the digestion system on the fasting day. On the day of Shivaratri, one should get up early in the morning and take bath. It is suggested to add black sesame seeds into the water. It is believed that the holy bath on the day of Shivaratri purifies not only the body but also the soul. If possible bathing in Ganges is preferred. After taking bath devotees should take Sankalp (संकल्प) to observe full day fast and to break the fast on the next day. During Sankalp devotees pledge for self-determination throughout the fasting period and seek blessing of Lord Shiva to finish the fast without any interference. Hindu fasts are strict and people pledge for self-determination and seek God blessing before starting them to finish them successfully. Devotees should abstain from all type of food during the fasting. In the strict form of fasting even water is not allowed. However, consumption of fruits and milk is suggested during day time which should be followed by strict fasting during night. In other words during day time fruits and milk can be consumed. Devotees should take second bath in the evening before doing Shiva Puja or visiting temple. If one is not able to visit the temple then makeshift Shiva Ling can be made to perform Puja activities. One can even shape the mud in Linga form and apply Ghee to perform Abhishek Puja at home. Shiva Puja should be done during night. 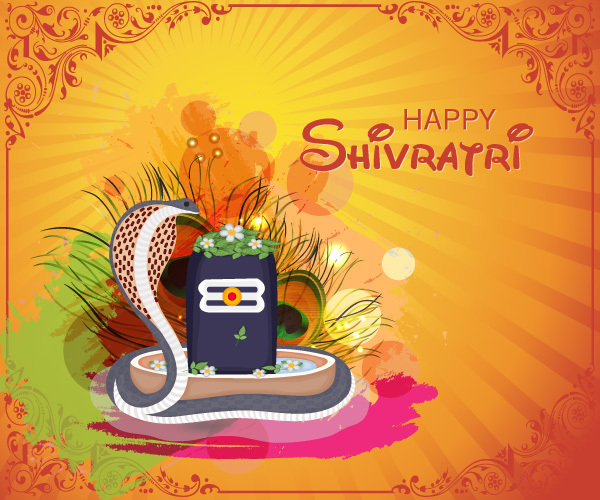 Shivaratri Puja can be performed one time or four times during the night. The whole night duration can be divided into four to get four Prahar (प्रहर) to perform Shiva Puja four times. Devotees who want to perform single Puja should do it during midnight. Please check Maha Shivaratri Puja Timings to know timings of four Prahars for your city. As per Puja Vidhi, Abhishek of Shiva Lingam should be performed with different materials. The milk, rose water, sandalwood paste, yogurt, honey, Ghee, sugar and the water are commonly used for Abhishek. Devotees, who perform four Prahar Puja, must perform water Abhishek during first Prahar, curd Abhishek during second Prahar, Ghee Abhishek during third Prahar and honey Abhishek during fourth Prahar apart from other materials. After the Abhishek ritual, Shiva Linga is adorned with the garland made of Bilva leaves. It is believed that Bilva leaves cool down Lord Shiva. After that Chandan or Kumkum is applied to the Shiva Linga which is followed by lighting lamp and Dhupa. The other items which are used to adorn Lord Shiva include flower of Madar (मदार) which is also known as Aak (आक), Vibhuti which is also known as Bhasm. Vibhuti is sacred ash which is made using dried cow dung. The mantra to chant during Puja duration is ॐ नमः शिवाय (Om Namah Shivaya). Devotees should break the fast next day after taking bath. Devotees should break the fast between sunrise and before the end of Chaturdashi Tithi to get maximum benefit of the Vrat. Please check Maha Shivaratri page to know the time to break the fast for your city.